Having the right elements for your design is only half of the journey to creating an awesome visual. 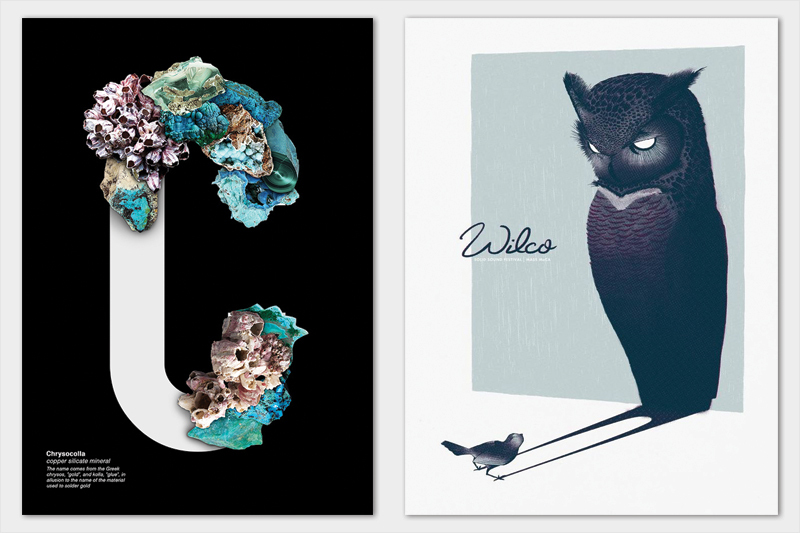 Now comes the part where you put everything together to create a harmonious combination of shapes, colors and typography. Even as a non-designer, you've recognized the difference between awkward-looking visuals that make you think "something just doesn't feel right" and content that is so pleasing to the eye that it draws you in and compels you to look more closely at its different elements. In this post, we'll go over some of the ways you can apply basic composition rules to create more effective, professional-looking visual content, even without a design background. 1 Create a focal point. One of the most apparent marks of an effective design is the way it draws your gaze to a central focal point. Just like with any other form of communication, every design must have a core message and a clear goal. This can't be achieved, however, if the viewer doesn't know where to look first because there is no one thing that stands out. 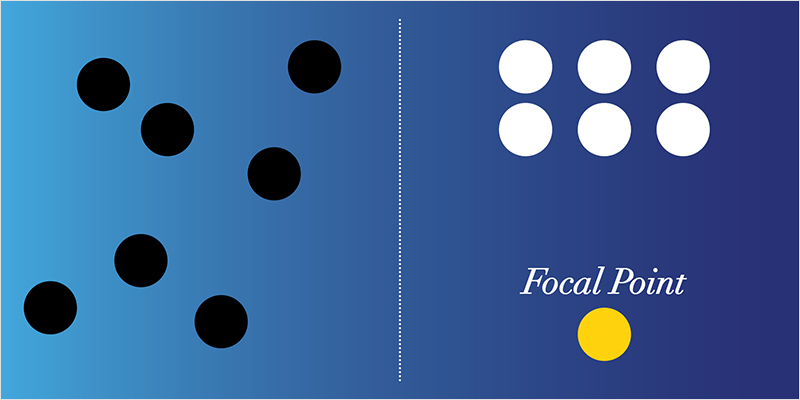 In the case of the poster to the left, the size of the central image and intertwined letters is bigger in comparison with the rest of the objects, which helps to create a central, dominant element. Its contrast with the dark background, along with the illusion of depth and the lines leading up to it, cause our eyes to immediately hone in on this part of the poster. 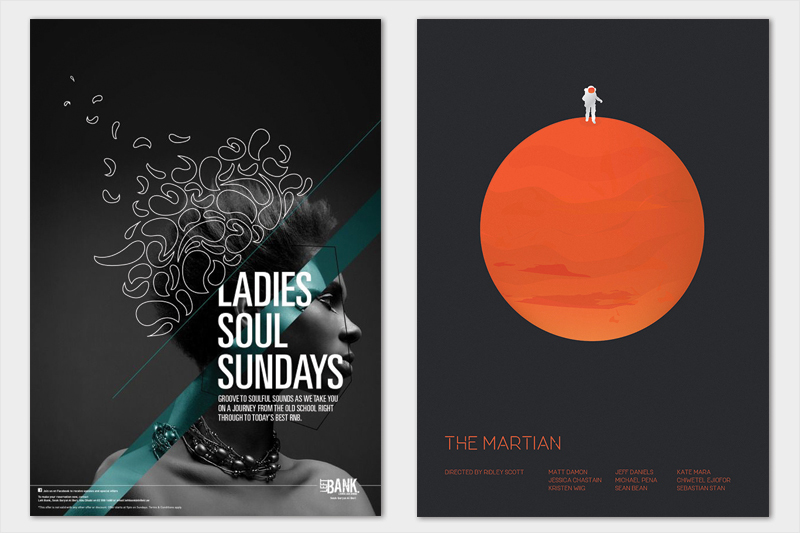 The poster on the right also draws viewers' eyes to a clear focal point. In this case, our gaze is instantly placed on the face of the girl lying down on the floor. Besides the contrast created by the green shirt over a muted background, the pattern of the pavement and the caped woman's arm both create implied lines that lead viewers to focus first on the subject's face. The goal of a good visual design is to orient viewers' eyes in a specific direction. The first step to doing this is creating a visual entry point into your design using a focal point, as covered above. Then, you can provide a path for your viewers' eyes to follow by applying other rules, such as visual hierarchy principles, which guide the arrangement of elements in a way that communicates the relative importance of each. The design on the left, for instance, does just this by varying certain characteristics, such as size, contrast, color, typography and spacing. Even a viewer not trained in graphic design can tell that the most important part of the message is the title "Camp Fair" in large, bold white letters. 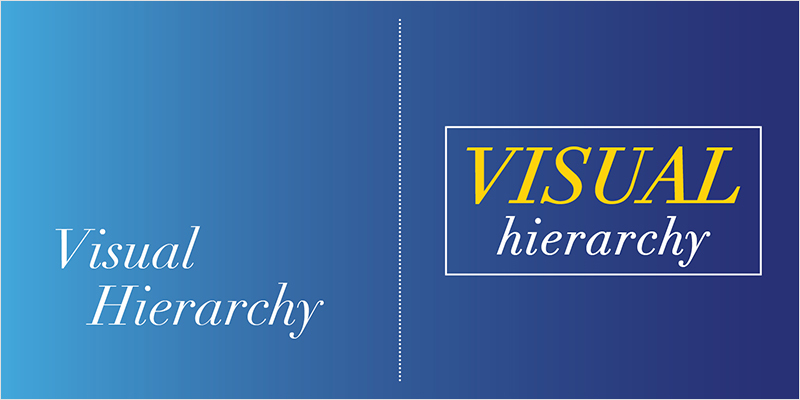 The design on the right achieves the same effect by applying the same visual hierarchy principles. When you first look at it, your eyes most likely follow this same path from the most important element to the least: 1) The title; 2) The man below the words; 3) The woman next to the man; 4) The number "800"; 5) And then the text to the bottom right of the page spread. Another effective technique for creating a visual journey with your design is to use what are called leading lines. Either implied by the natural shape of objects (such as the woman's arm reaching out in the first example above) or explicit through the use of actual lines, leading lines are used to direct readers' eyes to other elements on a page. A perfect example is the design to the left, which uses this technique to first draw attention to the focal point ("unspooling") and then orient the eyes toward the information on each of the different lines; first the list of names in yellow, then the words in red, and so on. While the image on the right is not as eye-catching as the first, it also uses leading lines to orient the gaze toward the focal point. In this case, the leading lines are implied by the shape of the piano and the elongated stems of the flowers over the piano cover. 4 Scale elements to create effects. 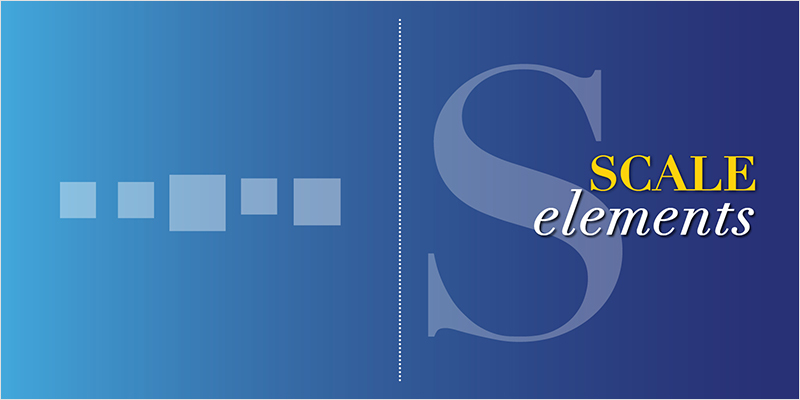 Another way to indicate the relative importance of elements is to adjust their scale. For example, the most important elements are usually larger and more prominent than less important ones. In this way, scale is used to establish the dominance or visual weight of an object. In an effective design, all elements shouldn't have the same visual weight; if so, they would all be competing for attention and the viewer wouldn't know where to look first. The poster to the left, for instance, uses an oversized element to create a dramatic effect and quickly draw attention to a clear focal point. The one to the right uses the same technique, but in this case it is used to emphasize the relative smallness of the bird in relation to the owl. The leading lines implied by the shadows also lead us to look from the owl to the bird and then back to the owl again. In most cases, you will want to achieve a balanced design in order to create visual harmony. 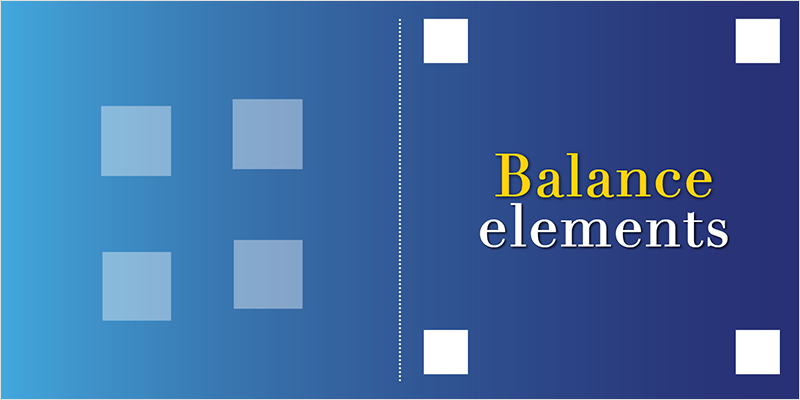 But what exactly does "balance" mean in the context of graphic design? According to Smashing Magazine, the concept of visual balance can be compared to balance in the physical world. Just as the scene of one very small person and another very large one sitting at opposite extremes of a perfectly balanced seesaw would throw off most viewers (as this would be physically impossible), so would an unbalanced design. Like in the real world, each element carries a visual weight determined by its size, color and shape, among other things. For example, a large circle would have greater visual weight than a small one; or a highly textured object would have more weight than a flatter element. Just like you would try to balance physical objects on a seesaw (by perhaps having the larger person move toward the center), so would you adjust the placement of visual elements on a page to achieve balance in a design. Knowing this, you can achieve balance in a design either through the use of symmetry or asymmetry. While the first is often regarded as harmonious and balanced, it can also be perceived as boring due to its static nature. Asymmetry, on the other hand, is not conventionally seen as appealing but can be interpreted as dynamic and stimulating. Take a look, for example, at the design on the left. Although asymmetrical, with most of the elements placed to the lower right of the poster, it is balanced out by the illustration, which carries significant visual weight due to its contrast with the dark background image. 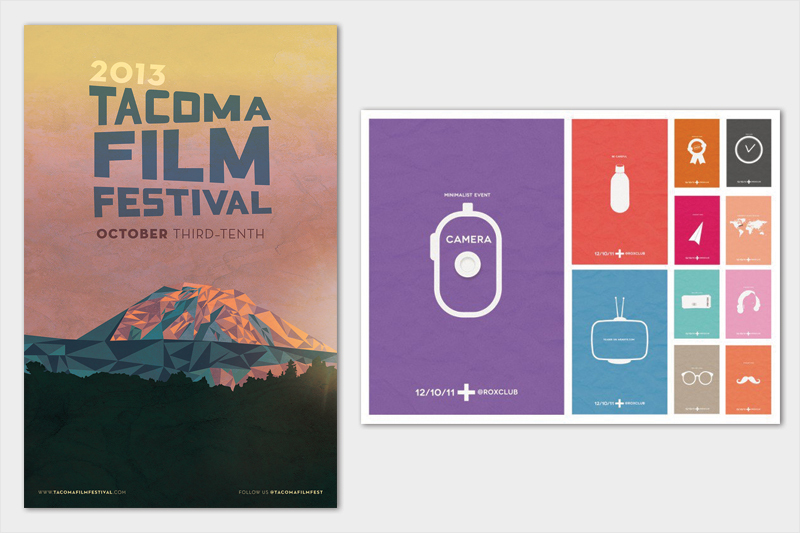 Or, consider the poster on the right. It is mostly a symmetrical design that, although static and simple, is captivating due to the dramatic effect created by the contrast of the orange against the background and the effective use of negative space. 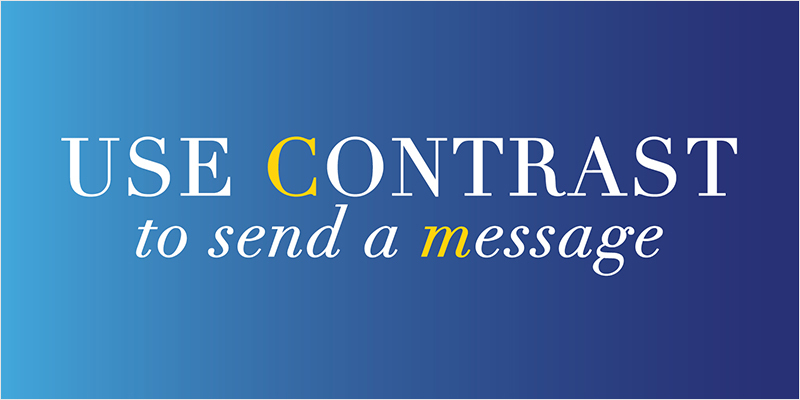 6 Use contrast to send a message. 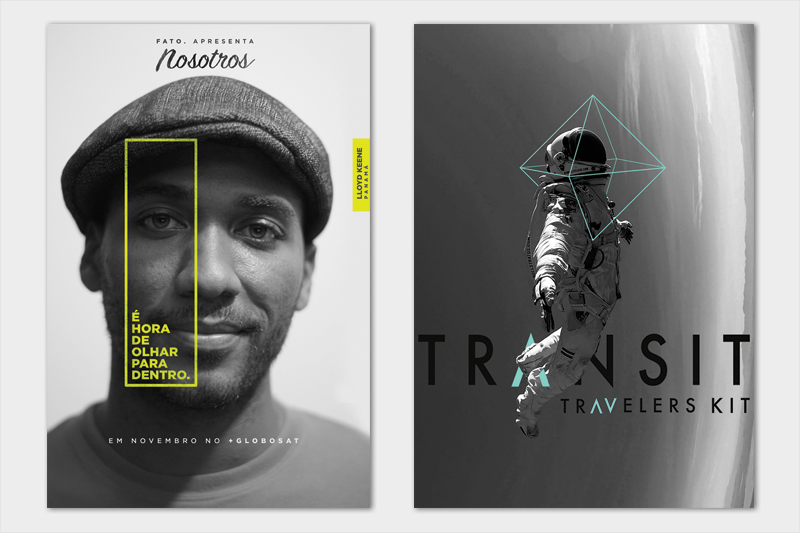 Contrast is one of the most effective tools for making certain elements in your design stand out. As human beings, one of the first things our eyes notice is difference, whether this be a difference in color, shape, texture, size or position, among other things. By nature, we tend to group similar objects together and differentiate between those that are dissimilar. Take, for example, the poster on the left. Our eyes are immediately drawn first to the object that stands out the most: the yellow rectangle and the words contained within it. Our gaze then moves on to the subject's face, the title and then the surrounding text. In the second poster, we see the same effect. Color is used to create contrast and thereby draw attention first to the subject's head and then down to his feet and the textual message. 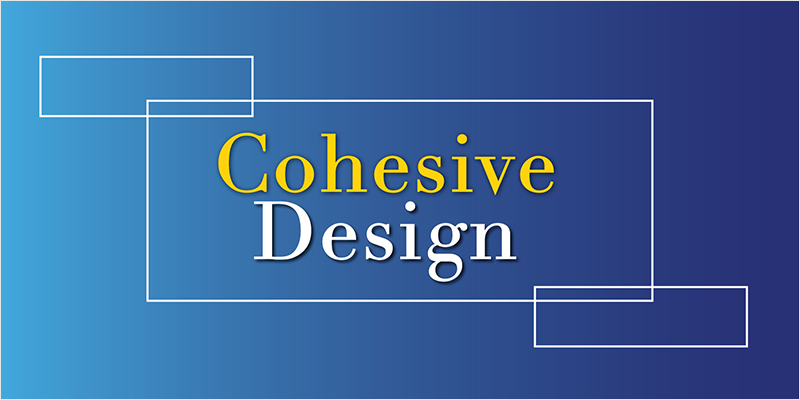 7 Create a cohesive design. 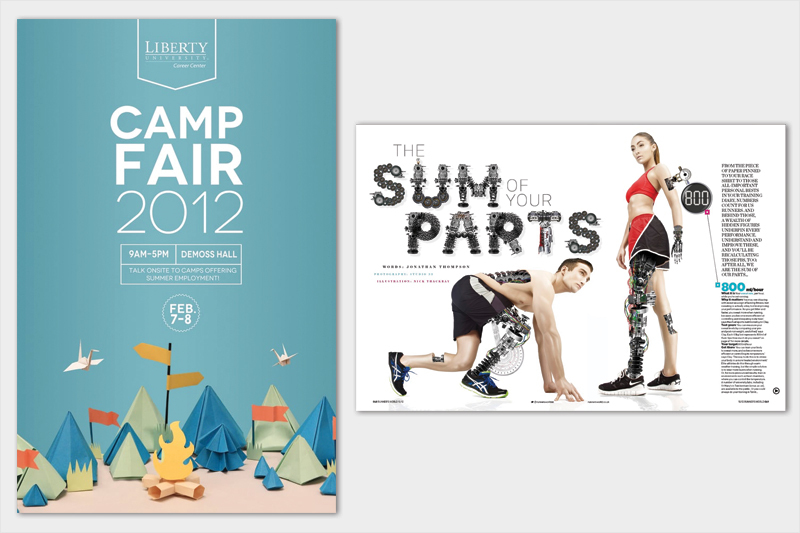 To create a well-composed visual, you also want to tie elements together to form a whole. By using complementary elements throughout, you can achieve a sense of unity and cohesion. 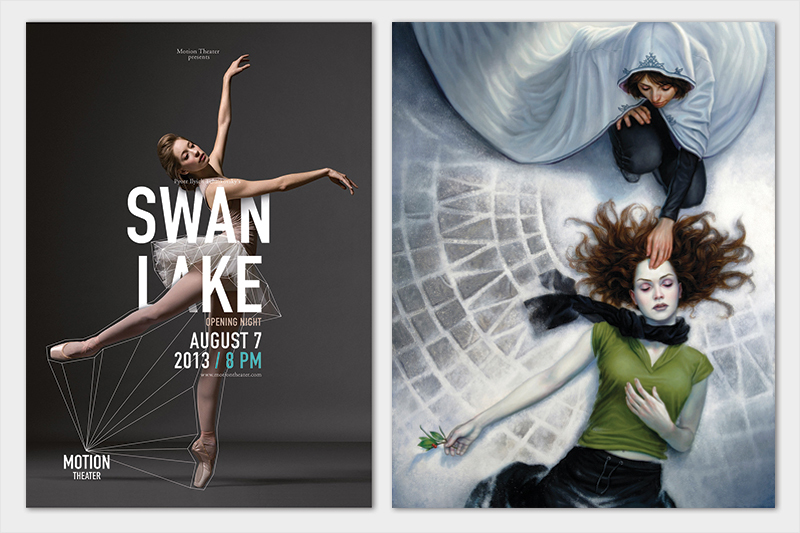 The poster to the left, for example, effectively creates a unified whole by using a running theme that acts as the invisible thread that pulls the design together. In this case, this unifying theme is the use of shapes to create perspective, both in the text and the three-dimensional mountain scene composed entirely of simple triangles of different shades and colors. The same goes for the design on the right. Throughout the visual, the same white flat icons are used against a vibrant and colorful background. 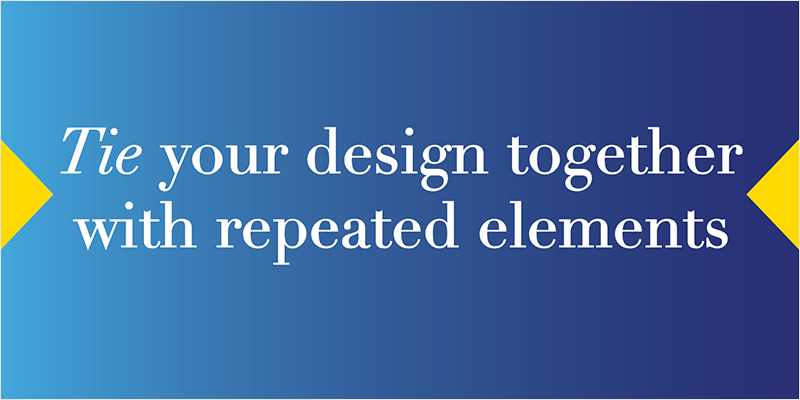 Another way to achieve a cohesive design is to repeat certain elements. This way, the viewer recognizes a visual pattern and knows what to expect next, especially when creating a multi-page design. In this magazine spread, for example, the same 90-degree triangles are seen on several pages, along with the same typefaces and geometric elements such as circles and hexagons. The color orange is also consistently used throughout, although the final two-page spread introduces a new yellow and black color combination that might throw the viewer off a bit. 9 Effectively use negative space. You've probably heard this before, but negative space (or white space) is just as important to your design as the positive elements. It has many functions within a visual: It lets the readers' eyes rest; it gives room for visual pathways that the eye can follow; it draws attention to the main elements of your design; and it makes your design look clean, sophisticated and efficient. Just look at how the design to the left creatively blends in negative space with positive elements, drawing attention first to the colorful skyline, then to the buildings and rain, down to the lone man with the umbrella. Or, consider the example to the right which uses a significant amount of negative space to create a sense of drama and suspense. Also, it is useful for highlighting the smallness of a cottage in the middle of a vast and barren setting. 10 Use grids to align your elements. 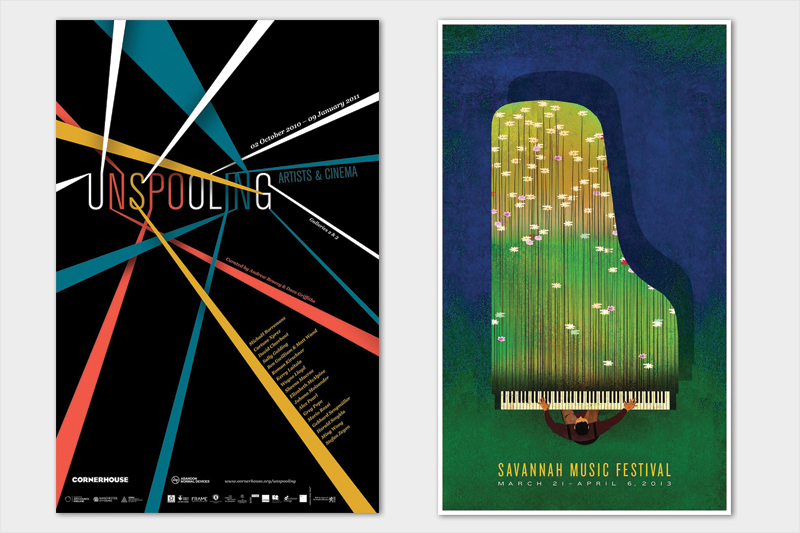 Look at how these two posters use the same grid layout to properly place elements in a harmonious and visually appealing manner. 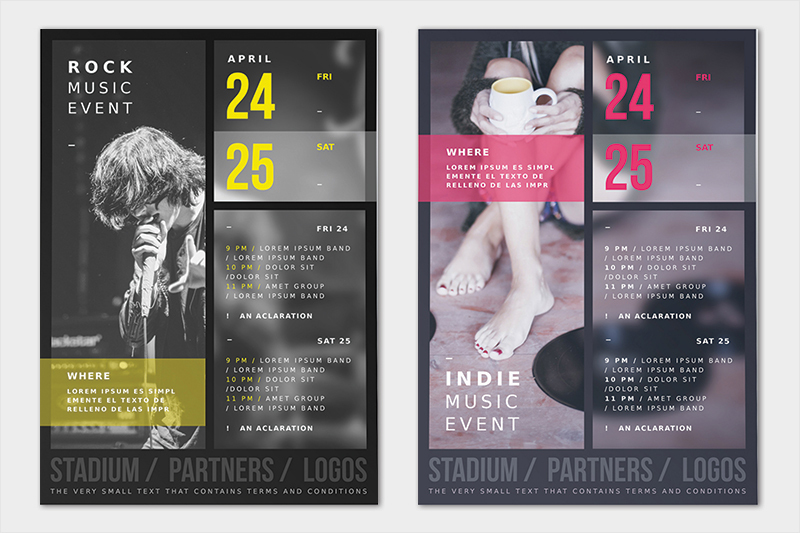 Since the layout has already been predetermined, it makes the work of composing your design a whole lot easier. 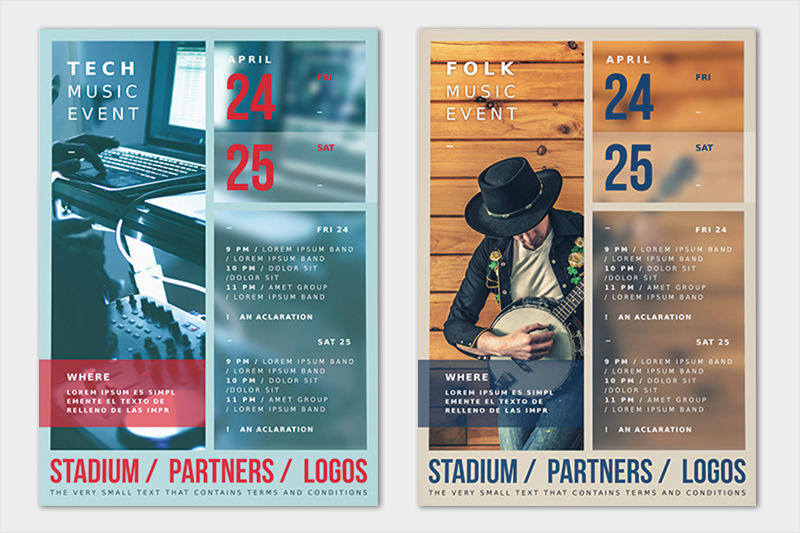 So, instead of simply eyeballing the placement of your elements, try to use a grid to make your designs look more organized and balanced. They can also help you identify your focal points and lay out the visual path you want viewers' eyes to take. 11 Follow the rule of thirds. Finally, there's the very important rule of thirds, which you can follow by simply dividing your canvas area into thirds, both horizontally and vertically, as seen above. According to this simple principle, your focal points should lie at the intersections of these lines. 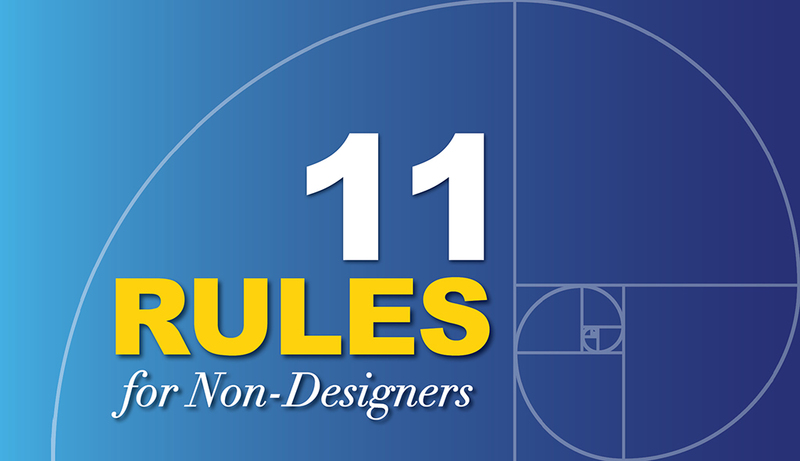 Although not a principle that must be followed for each and every design, the rule of thirds is helpful for creating dynamic designs that are not completely centered and symmetrical. Also related to the rule of thirds is the Fibonacci sequence. When expressed as a rectangle, it produces a golden spiral seen in many well-known artistic pieces, as well as in nature, from hurricanes to flower petals. 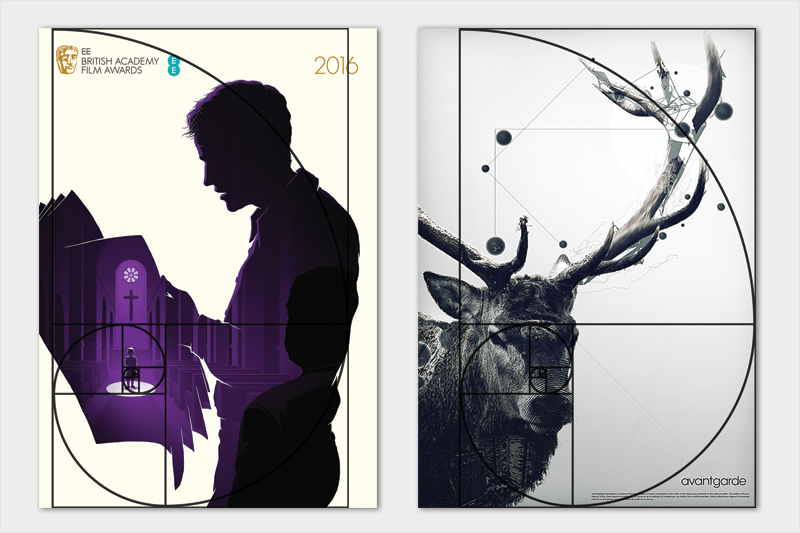 When you overlay the Fibonacci spiral on the two posters above, you see that both have elements placed in accordance with this golden ratio and have focal points at the intersection of an invisible grid of thirds. 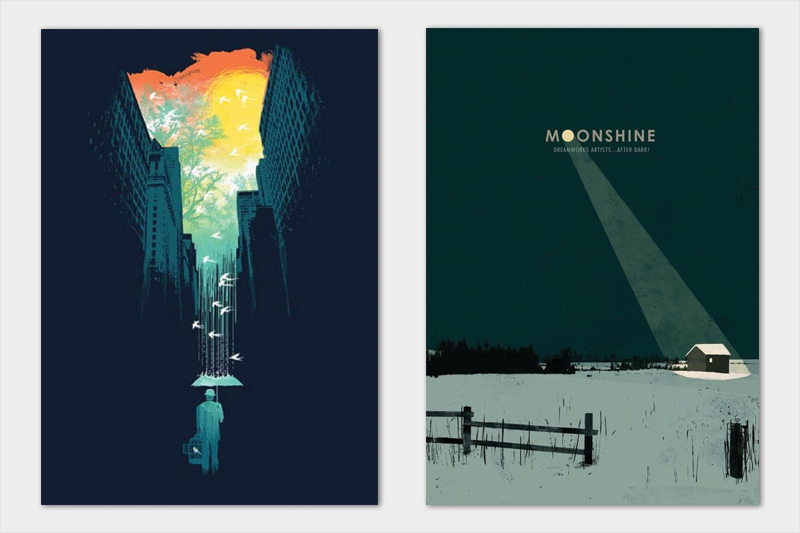 How have you applied these composition rules to create better designs? We would love to hear your comments and questions. Or, if you would like to share your project with us, don't hesitate to drop us a line in the comments section below. Thanks, Howard. Glad you found it useful. Thank you! I just made a poster and found out that it follows the Fibonacci sequence 🙂 it`s much easier to make designs by knowing this. Your guides and advice is unbelievably helpful, I was thoroughly scratching my head on where to start studying elements of motion graphics design. But, I’ve just been going through one visme article after another and I’m walking away now with a wealth of information that’s incomprehensibly prepared me better than I had been a mere few hours ago. Thanks so much!!! Thanks for the feedback. Glad you found it useful.